Chapter 157: The rice is cooked Original and most updated translations are from volare. If read elsewhere, this chapter has been stolen. Please stop supporting theft. Although Zhangsun Che hadn’t really done anything to Murong Wanru, everyone had witnessed the scene between them in the bedroom. It was enough to turn all their faces red. To put in another way, Murong Wanru’s chasity had been stolen by Zhengsun Che, so his crime was inexcusable. How could Grand Concubine Yi let them off easy? Even if she killed him, she still wouldn’t be satisfied! But Murong Wanru was still an unmarried maiden. She might have lost her chasity to Zhangsun Che, but what would she do if he died? Who else could she marry? Would any families greater than Marquis Pingbei’s house be willing to take her? Even if she lowered her standards, there was little chance of respectable families wanting to marry her. Those who were intelligent understood that the only solution to salvage Murong Wanru’s fate was to marry her to Zhangsun Che! In the silence of the hall, Grand Concubine Yi sat without speaking a word. Marquis Pingbei was a smart man. Despite being angry at his son, he had already seen through the crux of the matter and its consequences. Seeing that Grand Concubine Yi still hadn’t moved to speak, he raised his head and spoke up first. When Marquis Pingbei finished speaking, Grand Concubine Yi gave him a vicious glare and pounded the table a few more times. Still, she didn’t speak. Marquis Pingbei secretly bumped his son. By now, Zhangsun Che was completely sober and naturally understood the ramifications of his deeds. His father’s nudge spurred him to raise his head. Thankfully, Grand Concubine Yi wasn’t looking his own, or else he’d definitely lack the courage. Grand Concubine Yi smacked her table, angry eyes swiveling towards him. Frightened, Zhangsun Che immediately lowered his head, not daring to utter a sound. Seeing him act like a cowardly mouse, Grand Concubine Yi was even more angry and dissatisfied! Of course she knew that the best solution--the only solution--was to have Murong Wanru wed below her social status to this Zhangsun Che. But she really couldn’t bear to do it, much less accept it. As the foster daughter of the Duke of Qin’s estate, Murong Wanru and the first son of Marquis Pingbei were still considered an equal match. But the North Lord of Marquis Pingbei’s estate was known for being naturally amorous. He’d even taken a share of his father’s concubines. How could one marry a man with such a licentious personality that ruined the ethics of his own clan? Wouldn’t Wanru’s happiness being ruined for life if she married him? Moreover, Grand Concubine Yi never had intentions of marrying Murong Wanru to outsiders! Although Han Yunxi had brought up marriage talks with her before, Grand Concubine Yi had only gone through the motions when agreeing. In her heart, she still couldn’t bear to part with this daughter and hoped for the day she became one of the Duke of Qin’s concubines. This way, she could stay at home and be her companion. Now look at what happened. Not only did she have to marry, but it was to a scoundrel like him! Marquis Pingbei kept tugging at his son’s robes to remind him to have more guts. Sadly, although Zhangsun Che looked elegant and unrestrained, self-important and wealthy, he was one of those types that was strong in appearance but weak in reality. As a man without any inherent courage, he’d lost the daring to lift his head against after Grand Concubine Yi scared him with a look. Moreover, he wasn’t satisfied with marrying Murong Wanru, either. Once the foster daughter from the Duke of Qin’s estate married into his house, wouldn’t he be watched closely? Where would his good days go then? Actually, Grand Concubine Yi understood all of this without Han Yunxi having to say a word. But she just couldn’t swallow her anger! Zhangsun Che had committed the crime, but not only did he escape punishment, he even gained a wife out of it! Seeing that Grand Concubine Yi still wouldn’t relent, Han Yunxi’s eyes glinted with craftiness as she continued. Even Han Yunxi herself thought these words were laughable when she spoke them. Arranging an engagement with drums and a grand fanfare was equal to cooking the rice. A marriage was imperative after such an act, so there was no room for second thoughts. But under these circumstances, her suggestion was like a cup of cool tea for Grand Concubine Yi’s pent-up anxiety. It finally extinguished the fiery temper lodged in her heart! Grand Concubine Yi didn’t want to spare Zhangsun Che another glance, much less talk with his family. She had no choice but to agree. After the decision was set, Grand Concubine Yi finally recovered somewhat from this blow. She looked coldly at Marquis Pingbei with a lofty air. That was a command, not a point of debate. When Grand Concubine Yi finished, she shook her sleeves aside and rose to leave. Only Marquis Pingbei’s party of three were left kneeling awkwardly in place. Wanru and the young lord, adoring each other? “Since when have Murong Wanru and I ever…” Zhangsun Che asked in confusion before Marquid Pingbei furiously muffled his mouth. Han Yunxi loved talking with smart people. She trusted that tomorrow’s betrothal ceremony would be filled with enough ostentation and extravagance to match the actual wedding procession of a bride to the bridegroom’s house. She didn’t cause them any further difficulties, but left them with a few brief words before letting them go. At the same time, Grand Concubine Yi was trying to convince Murong Wanru in her Orchid Enclosure. Anyone standing by the door to the courtyard could hear the indistinct sounds of Murong Wanru sobbing, and her occasional outbursts against Grand Concubine Yi. Han Yunxi only spared the place a glance before she suddenly burst into a laugh. White lotus, ah, white lotus. I’m afraid even you didn’t expect to fall into your own trap! Once the betrothal was set tomorrow, the white lotus should be married off by the time New Year’s passed. Thinking up to here, Han Yunxi could help but yearn for her future days ahead. With no white lotus at the estate and harmonious relations with Grand Concubine Yi, her life would be much more smooth and steady. Neither would she be restricted to one corner of the Hibiscus Courtyard. When she arrived at its entrance, she paused to look at the distant, darkened sleeping quarters of a certain person and fell into thought. If I want to move out of Hibiscus Courtyard one day, Long Feiye shouldn’t refuse, right? He’d rather I keep as far away as possible from his territory, right? Early next morning, Xuanwu Street was filled with the sound of exploding firecrackers. Most families traveled ten li in red robes to take their brides home, but Marquis Pingbei’s estate was traveling ten li to bring betrothal gifts and secure an engagement. 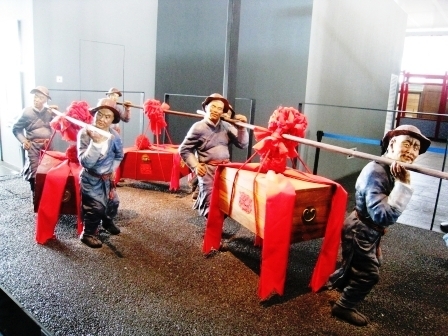 Pairs of pageboys carrying betrothal gifts between their shoulders snaked down Xuanwu Street like a vast and mighty dragon’s tail, creating a lively scene. Marquis Pingbei and his wife held hands with Zhangsun Che along the way, while a wedding nanny brought up the lead. Aside from Zhangsun Che’s somewhat unpleasant expression, everyone else was filled with smiles and happy faces. Marquis Pingbei’s estate wasn’t far from the Duke of Qin’s, but the procession purposely took a meandering path to attract more onlookers. It could be said that the whole capital came out to watch. As soon as they heard that Marquis Pingbei’s estate was going to ask the Duke of Qin’s estate for an engagement, rumors began to fly. Marquis Pingbei had arranged people in the crowds beforehand, so the story of Murong Wanru and Zhangsun Che being sweethearts and having secret meetings spread amongst them. Although the events at yesterday’s Plum Blossom Meet was spread around as well, they didn’t take the lead in the rumors. It was unclear how Grand Concubine Yi had coaxed Murong Wanru, but she was present at the engagement ceremony with red eyes. She kept glaring at Han Yunxi without a trace of her useful fraility. Most likely than now, she knew that this whole thing was Han Yunxi’s idea. Han Yunxi allowed her to stare as she liked, her mood excellent. What surprised her more was that Long Feiye had shown up as well. But on second thought, she realized that it was proper for him to be here since he was Murong Wanru’s brother. This wasn’t the answer Grand Concubine Yi wanted, much less Murong Wanru! After realizing that she had no more chances with the Duke of Qin in this life, Murong Wanru was filled with melancholy. Her eyes turned red again as she muffled her mouth and ran away… Everything had been caused by Han Yunxi. It was all her! She silently vowed in her heart to get back at Han Yunxi even if she got married! Looking between Murong Wanru’s state and her own son’s cool attitude, Grand Concubine Yi couldn’t help but furrow her brows. How vexing! li (里) - Chinese unit of measurement, used often to figuratively indicate a long distance, a vast expanse. Who was said to be sweet and pithy. Her future, now something to fear. Murong Wanru: Do you think this is funny? Kicking other people when they're down? Murong Wanru: My life was set! My future was fine. I wouldn't have needed to do any of this if Han Yunxi wasn't here.